Within the lean community, you often hear the phrase “problems are treasures.” This is most often applied to a company’s processes, in that problems within processes need not be shied away from but rather, when surfaced, can guide process improvement. Does this also apply to problems in our private lives? What is a kata? A kata is something most often associated with martial arts. It is a routine you practice purposefully with the intent of making that pattern a habit. Once you learn to drive a car and it becomes second nature, you no longer have to concentrate on the mechanics of driving and can focus on navigating the road and getting to your destination. The Improvement Kata is a specific routine for improving, adapting and even innovating. It is scientific and goal-directed, not a random disconnected reaction to problems. The overall goal, as with any kata, is to make the routine of the Improvement Kata a habit that happens almost unconsciously. The Improvement Kata provides a systematic, scientific routine that can be applied to any goal and practicing it transforms you from a role of a firefighter to scientist. Three summers ago, my wife Sarah and I discovered a devastating family problem. She was 20 weeks pregnant when we learned that the baby she was carrying literally had half of a heart. If he survived to be born, he would need a series of open heart surgeries, eventually culminating in a heart transplant. Whether he would live to see kindergarten would be a coin flip. We found ourselves in a state of stunned disbelief, like a surreal but persistent daydream. That disbelief quickly gave way to paralyzing fear as we could only see vast uncertainty before us. Sarah and I were terrified, and it was all we could do to get through each day without breaking down at work or neglecting our one-year-old son Maxwell. Can a problem like this actually be a treasure? It certainly is not a problem we would choose, but given that it happened, the answer is yes. Fortunately for us, we uncovered this tragic defect just as I was transitioning at work from quality engineering to begin practicing. Specifically, my company wanted to experiment with deploying Toyota Kata — one of the most recently developed approaches on how to practice lean developed by Mike Rother — and I had been invited to help. The coincidence of my family’s struggle to manage our baby’s heart defect with my professional struggle to practice lean produced a lot of crosstalk between these efforts. Over time, the effort to help my son has grown increasingly dependent on applying the insights and skills that underlie the Improvement Kata, the methodology which is the kernel of Toyota Kata. I did not apply the improvement and coaching kata in a formal way as I was doing at work. There was no storyboard posted, and I did not try to teach my wife the terminology or methodology. Perhaps we would have been even more successful had we followed the process more rigorously. But I was guiding the process to follow the essential steps of the improvement kata — identify the challenge, grasp the current situation, identify near term objectives (target conditions) and experiment our way step by step. It was a major departure from how my past instincts would have led me to behave, which was much more reactive and short-term focused. 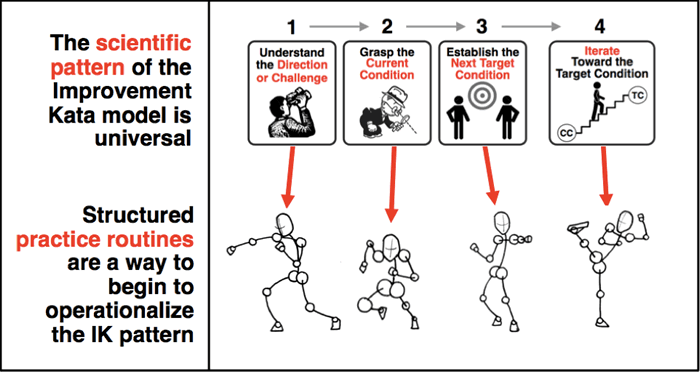 Applying the kata, even informally, helped us to think scientifically and systematically about each step on our journey with a clear focus toward a challenge. The following story of that application, and the resulting benefits, is offered as food for thought to leaders who think process improvement is limited to work processes. There is a much bigger picture. Figure 1. The Improvement Kata provides practice routines to develop scientific thinking. Three months before we learned that the baby had a heart problem, I was in Ann Arbor, Michigan, to take the University of Michigan’s course on Toyota Kata. On the first day of that course, Mike Rother, author of the book on the subject, presented a compelling seminar arguing that industry suffered from a deeply flawed approach to improvement. Improvement had come to be about experts leading improvement events, which generated implementation plans, which get delegated to various people for follow-up. What should we do when we reach our threshold of knowledge? Key realization: There's always a threshold of knowledge. 2) Stop and see further by conducting an experiment. Don't deliberate over answers. Deliberate over the next experiment. Figure 2. The Improvement Kata is useful for navigating through zones of uncertainty. One month before learning that the baby had a heart problem, I began a series of monthly cross-country trips to begin deploying this improvement approach at one of my employer’s small but forward-thinking subsidiaries. I began daily practice of the Improvement Kata, interloping in a particular value stream that had been getting negative attention from management. I was extremely fortunate to be able to practice under the guidance of a skilled coach, whose experience and personality enabled him to teach the Improvement Kata effectively. Every workday included a short coaching cycle to discuss the next step in my improvement effort, and a small chunk of time to go conduct an experiment within my practice process. Thus, I was developing the early thinking pattern of the Improvement Kata as we began to grapple with our baby’s problem. One stress-filled month after learning that the baby had a heart problem, we received our first diagnosis: Hypoplastic Left Heart Syndrome (HLHS). Very early-on in fetal development, something had prevented the left side of the heart from forming normally. We learned that our baby had a particularly severe form of HLHS, where the left side was completely absent. Whereas a typical heart has two ventricles — a right ventricle to pump blood to the lungs, and a left ventricle to pump oxygenated blood to the body — our baby only had the right ventricle. Amazingly, the configuration of a fetus’ circulatory system in utero enables it to develop almost normally despite HLHS, but once the umbilical cord is severed, these babies need almost immediate surgery to survive with their single ventricle heart. Actually, these HLHS kids, commonly referred to as “hypoplasts,” need not one but at least three open heart surgeries within their first few years to iteratively reconfigure their cardiovascular system so as to keep them alive. That series of three palliative surgeries essentially represents the best case. Complications are very common, if not the norm. Many hypoplast kids wind up ineligible for their next palliative surgery, need additional surgeries to address complications, or just do not survive for any of a multitude of reasons. Even if the three-stage surgical series is successful, these kids are destined for a heart transplant someday because their right ventricle just is not built for the workload of pushing blood through the body. The native heart eventually fails; it’s just a question of whether it fails within days, months, years or decades. These kids are incredibly fragile, and our medical team made sure that we understood the gravity of the condition and the possibilities before us. Termination was always the first option presented, as there were serious quality of life concerns in part because other major disorders often accompanied HLHS. We also were offered the choice of jumping straight to a heart transplant. However, outcomes of doing so were no better than the palliative series, in part because many hypoplasts died waiting for a suitable infant donor heart. We also were offered “comfort care;” allowing the baby to be born and then making him comfortable until he passed. There were no good options. HLHS is not a problem that can be “fixed,” and there was a strong potential that we would end up on a miserable path leading to one of myriad possible terrible outcomes. We wrestled with these choices quite a bit, but in the end, our decision was made much easier by the fact that although HLHS is quite uncommon, we were not the first family to face it. Decades of progress has been made in treating HLHS, and we discovered that there were many families out there raising perfectly happy and fairly normal hypoplast kids. We even found a handful of adults in their 20s living rich lives despite HLHS, the outliers of pioneering treatments. The Challenge: The starting point of the improvement kata is a direction set by a challenge. The challenge is typically multiyear and visionary, yet concrete. Often problem-solving methods focused on identifying a problem we wish to overcome. This can end up being a scattershot approach leading to a lot of good thinking about eliminating problems, but few real breakthroughs in performance. A challenge provides a rallying point, a focus, that can generate energy as each target condition gets us a little closer to challenge. Our challenge was clearly multiyear with no defined end point — providing our baby with the best change to enjoy a full life. It was concrete, and Sarah and I were both passionate and energized. This would allow us to think long-term and view each step as an experiment with a clear purpose. Toyota Kata teaches that we should strive to achieve a challenge, a much different mindset and process than working to fight off problems as they occur. It did not take long for Sarah and me to frame our challenge as providing our baby with the best chance to enjoy a full life. The first decision we made to work toward the challenge was to pursue the three-stage surgical approach and successfully navigating through this was a start at defining target conditions. It was immediately clear that there was no certain path to a successful outcome, and the journey would require a lot of experimentation and learning. We could only control what was within our control, and so we set out to do that. We named the baby Michael Beren, hoping that these names would give him and us strength. The next step in the Improvement Kata is grasping the current condition, and in this case, this meant amassing as much existing knowledge as we could. Sarah rolled up her sleeves and began reading everything she could find on HLHS. She joined online support groups for parents of single-ventricle kids and explored the highs, lows and technical details in the experiences of other families. She researched the different surgical centers treating HLHS, finding out who was who in our area and nationally. We were surprised to find out how much was in our control if we made the effort. Every step in our exploration of the current situation and state of knowledge raised more questions to be answered, which started to make us feel helpless. Did Michael have other defects? Was it worth the risk of testing the amniotic fluid to find out? What surgical center should we use? What surgeon should we use? Do we choose a center that is logistically convenient, or travel to a place with a better track record? Do we fight with our HMO to go somewhere other than our assigned center? Do we induce labor to control certain risks, or do we let labor occur naturally to avoid other risks? What technique is best for the first surgery? How do we prepare for birth? How do we prepare to bring a hypoplast infant home? How do we properly take care of Maxwell through all of this? Did I have time to stay at my job? How will we pay the medical bills? The swirl of questions became so overwhelming that we seriously questioned our ability to manage the effort. We were tempted to unload this burden by just letting the medical team make the plan, defaulting to whatever our providers told us about where to go and what to do, but we believed that we owed it to this baby to figure it out ourselves. And giving in would mean giving up on the challenge we had set. Figure 3. Conduct each experiment as quickly and cheaply as possible, so you can see the next step. The first target condition for Michael was surviving his first surgery, which carried a 25 percent mortality rate nationally. The process needed to achieve this outcome was to have the best surgeon possible performing the operation. There was a clear to-be-completed-by date, as we had two to three weeks for the decision. We made telephone appointments with different pediatric heart surgeons in the region and interviewed each, adapting our questionnaire based on what we learned from each discussion. There were many individual obstacles we needed to overcome on the way to this decision point. We did what was needed to move as quickly as possible. For example, for one call Sarah conducted the interview while I ran frantically around a noisy airport terminal in Atlanta to find a relatively quiet spot where I could listen. After the interviews, we talked about the data each surgeon had provided, the techniques each used, the advantages of their surgical centers and our impressions of their personalities. Finally, we selected a surgeon who had not lost a hypoplast during first-stage surgery in over two years, with an established track record at his hospital and a demeanor that we agreed was more in line with our hands-on approach than that of the other surgeons we interviewed. Making that decision felt really good — a big step toward our first target condition. Not only did we feel good, but we had answered some questions without ever focusing on them. We would in fact need to travel for birth and surgery, but only 90 miles from home. We would not need to fight with our HMO, because it had a contract with this surgical center. Other questions, such as whether to risk amniocentesis, turned out to be irrelevant because they never got in the way of where we wanted to go. It was time to set our second target condition, which was to be situated within minutes of the hospital when labor started naturally. This would include Sarah, Max and me together as a family as we waited, with a family member available to come watch Max from when the time labor started until the first surgery was successful. One of the things I learned from Toyota Kata was the importance of focusing on one target condition at a time and one obstacle at a time, iterating step by step. This also means ignoring extraneous issues. We let one target condition after another tell us what needed our attention each day, using the time until Michael’s due date to deal step-by-step with the details that were truly necessary to put us exactly where we wanted to be. Our effort was rewarded with success: Michael was born healthy, did very well in surgery and was able to be discharged in a relatively short amount of time. Yet that favorable outcome was only part of the reward. Our approach had enabled us to break through our paralyzing fear and begin to manage a terrifying situation. We have since learned that most parents in our shoes largely defer to their medical team’s recommendations, and without understanding the thinking behind the Improvement Kata, we might have done the same. Beyond that, and less tangible, was the feeling of comfort that came from letting go of the common — and burdensome — desire to plan out the complete path forward. It was such a relief to feel like it was okay to ignore most of the issues facing us, and that we might actually be better off by doing so. Although we had applied the Improvement Kata informally, doing so had made a significant difference. This informal application of the Improvement Kata continued as we got Michael home and tried to figure out life as a family with two kids in diapers, one of whom being a fragile and terminally ill infant. We brought Michael home when he was about three weeks old, and by then we had found a clear long-term vision: a day when Michael enjoys perfect mental and physical health. Although such a day may prove to be completely unachievable, this vision shapes how we manage his care. For example, we have the long-range goal of keeping Michael thriving on his native heart until science is able to construct a fully functional heart built from his own DNA. Today, a heart transplant recipient must undergo extremely harsh anti-rejection therapy, defeating their immune system to force their body to accept foreign heart tissue. Multiple branches of research are working on the problem of creating a heart with tissue that the transplant recipient will not reject, and there is some incredible progress being made. With this challenge in mind, we asked Michael’s medical team to extract the blood from his umbilical cord immediately after birth, and he now has trillions of his own stem cells preserved in Arizona awaiting a day when science enables him to use them. Since that goal of getting Michael “his own” four-chambered heart is much too distant to be actionable for working with him day-to-day, we always have a shorter-term target condition that we think moves him toward that distant goal. These shorter-term objectives are the focus of most of our effort with him, and that long-term goal acts as compass to guide us whenever we encounter problems along the way. One example of this approach is our work with Michael’s feeding problems. Most hypoplast infants leave the hospital with some sort of feeding tube, and Michael was no exception. Michael came home from the hospital with a nasogastric (NG) tube, which entered through a nostril and proceeded down into his stomach. Every three hours, we would use a feeding pump to push a meal of breast milk through his NG tube into his stomach. In Michael’s first several months of life, he would vomit 10, 20, 30 times a day, losing precious calories with each episode. No one was sure why this was happening, but the bottom line was that his weight gain was terrible. Studies have correlated higher weights with better surgical outcomes, so one of our target conditions was to get Michael to his second-stage surgery at a sufficient weight to enable him to survive the surgery and recover well. His medical team was also focused on maximizing his weight. However, we often found that their recommendations took us off course from the direction that the compass of our long-term goals indicated. Suspecting food allergies were behind the vomiting, one physician asked Sarah to stop feeding breast milk and switch to a hypoallergenic formula. Yet breast milk is known to produce better long-term health than formula, and several details gave us doubt that a food allergy was to blame, so we pushed for another solution that could test this hypothesis without taking Michael away from the direction we wanted him to go. In one experiment, rather than eliminating breast milk, with this physician's concurrence, Sarah eliminated all dairy, soy, tree nuts and seafood from her diet. That was not fun, but it seemed like a better way forward. Yet the vomiting continued, once again teaching us that not all hypotheses will be supported. The recommendations from the medical team continued to roll in, and they continued to concern us with the direction they would take Michael. A controversial medication was recommended to prevent vomiting, but it carried a risk of dangerous and permanent side effects. What we were learning from the Improvement Kata drove us to research that recommendation, and through dialogue with the recommending physician, we concluded that the evidence did not strongly support using that medication, and we respectfully declined. Another recommendation was to push Michael’s NG tube past his stomach and into his intestinal tract. This meant that we would need to feed him a special pre-digested medical formula instead of breast milk, with frequent x-rays taken to check tube placement. 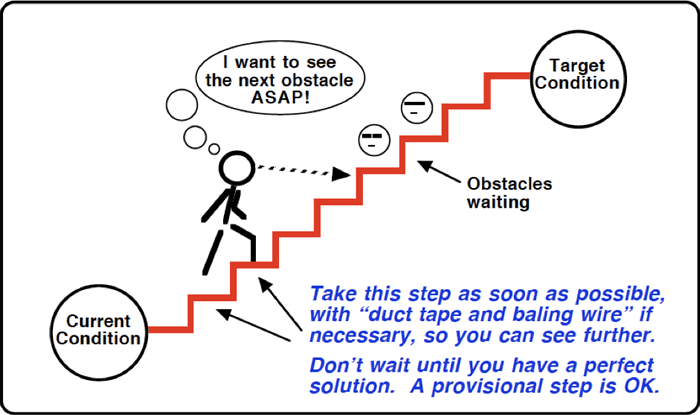 When facing an obstacle, the Improvement Kata teaches looking for small, quick, inexpensive steps that test underlying assumptions safely without abandoning your target condition. In contrast, as a culture we have the habit of jumping to solutions for the obstacles we encounter, often making inherent and flawed assumptions in the process, sometimes taking measures so drastic that they completely change the direction we're headed. We saw pushing the NG tube beyond Michael's stomach as the latter approach, and declined that recommendation in favor of a smaller step that tested the underlying assumption yet kept us moving in the right direction. Yet another recommendation came to perform fundoplication surgery, which manipulates the esophagus so as to make vomiting impossible, but again our concern drove research that told us it was not right for Michael. We declined. This struggle peaked with Michael being admitted to the hospital at three months of age for failure-to-thrive, spending a week inpatient as Sarah and I wrestled with the medical team over how to get him to gain more weight. Michael’s medical team grew increasingly frustrated with our failure to take their recommendations, as we grew increasingly frustrated with their recommendations that seemed hastily formed and inconsistent with the details we saw in caring for Michael every day. A couple days into the stay, one of the physicians put forth a thinly veiled threat of asking a judge for conservatorship to gain control over Michael's care. I responded by pointing out that the team had agreed with our logic and supported our decisions all along the way, and that some of their initial recommendations had actually been ill-advised in light of the details that we provided. This unfortunate situation placed visible stress upon everyone involved, all good people seeking to do what was best for Michael, but hindered terribly by an inability to reconcile disparate mindsets. It wasn't that we had rigorous conclusions or peer-reviewed data telling us to avoid the team's recommendations, and we did not find our next steps in medical literature. And indeed, the physicians were recommending solutions generally accepted in the medical community and based on peer-reviewed data showing value across a population in which Michael appeared to fit. Instead we chose to rely upon our own deep understanding of Michael's current situation built through closely observing his patterns as we cared for him each day. Of course, we also regularly queried our medical team for technical details throughout the process, as well as the families in our online support group for relevant experience they might possess. We made small decisions at high speed, sometimes several in a day, experimenting to see what happened and whether we made progress. That experimentation included countless variations in Michael’s feeding regimen. We varied how much he was fed at a time. We varied how quickly the milk was delivered. We varied the frequency of feeds, and the ratio of how much was fed during the day and overnight. We started adding fortifiers to the breast milk to add calories, and worked our way through several different fortifiers. We tried different types of feeding pumps, and even tried using syringe-based setups with no pump at all. And we learned. We found that if we could get Michael to sleep through feeds, he tended to keep the food down well. We found a particular fortifier that was easier on the stomach and more likely to stay down. We began to see patterns that convinced us that his vomiting had nothing to do with a food allergy, at which point Sarah celebrated with a big ice cream sundae covered in chopped almonds. While our medical team was brainstorming countless solutions, we were rapidly experimenting and learning with the Improvement Kata. At about five months of age, Michael had his second surgery. During the pre-operative consultation, Michael’s surgeon complimented his weight. We were exalted and vindicated. Michael tolerated his second surgery well, recovered well and was discharged quickly. At one point during his stay, a nurse decided to go get a more skilled technician for a routine blood draw, commenting after a few minutes of inspection that he was too chubby for her to find a good vein. Strange thing to be proud of, but I was deeply proud of him — and us — and my confidence in our approach was reinforced. Michael’s medical results were only part of the reward. In our strange little world, cloistered away in our home and avoiding friends and family to protect Michael from illness, our family had somehow grown much more whole. We discovered Michael to be an incredible child: sweet, quick to smile, patient with the burdens he bore and full of love. We discovered Maxwell to be an amazing big brother: kind, doting, eager to help despite the excessive parental attention that his little brother stole away. We began to find peace and beauty in small, simple moments at home raising a two-year-old and a terminally ill infant, and started to see that Michael’s heart might be more treasure than tragedy. Although we were coming to appreciate our complex and uncertain life, we looked forward to the time after Michael’s second surgery when many hypoplasts begin to have a much easier course and their families resume a more normal life. This would not be Michael’s fate or our story. In the months following his second surgery, Michael developed serious complications. A valve in his heart had begun leaking badly, and on top of that, the major artery carrying blood from his heart had developed significant narrowing from scar tissue. These issues were significantly increasing the load on his already overworked ventricle, implying that both complications needed to be repaired. Further, as these problems appeared, we learned that his surgeon had completely disappeared, walking away from his hospital due to internal politics and leaving no contact information for patients or staff. A new target condition had presented itself: to get Michael to a surgeon with a skill set that offered excellent chances of repairing the leaking valve, with a treatment plan that would reliably and sustainably address the narrowed artery as well. We picked our way step by step toward that objective, figured out how to deal with any obstacle that appeared truly in our way, and got Michael to a different center for a third open-heart surgery to repair the complications. Another success, or so we thought. Before we realized that both repairs had failed, we turned our attention back to Michael’s feeding. He was now one year old and still fed through an NG tube, which physicians generally prefer to remove after a few weeks in favor of a more permanent solution. For many kids, that more permanent solution is a gastrostomy tube (or G-tube), a feeding tube surgically inserted into the stomach and accessed by a port on the abdomen. Michael’s medical team began to push hard for that solution. Yet again, our compass pointed a different direction, because we had learned from the stories of others in our support group that kids fed by G-tube often developed tube dependencies as they grew older, perhaps never achieving a healthy relationship with food. Further, our observations from working with Michael told us that he had both the interest in eating and enough basic oral skills to give him a reasonable shot at transitioning to oral feeding. Again, we told his medical team “no,” and instead asked for their help to go in a healthier direction. Our next target condition evolved naturally to get Michael eating strictly orally, tube-free and gaining enough weight to do well during his third-stage surgery. Again, our target condition was not founded in medical rigor, and we didn't have a best practices protocol that would lead us to success. We freely admitted that Michael may actually need a G-tube to make progress. Having a correct target condition is not a requirement of the Improvement Kata. A target condition itself is just a hypothesis, an assumption that if the pattern of operating (specified in the target condition) can be reached, the desired outcomes will follow and progress will have been made toward the challenge. The Improvement Kata does require that every target condition include an "achieve by" date to drive reflection on the usefulness of the target condition itself in pursuing the challenge, and mandating that a new target condition be formed by taking into consideration any lessons taken from that reflection. In the case of this target condition with Michael, rather than setting a hard date for our goal, we set a weight loss threshold — if his weight loss reached one pound during our effort, we would reconsider the G-tube. This clearly was not a path we could plan, so we just started experimenting. We brought in therapists. We bought oral training implements, and Sarah spent hours a day going through oral exercises to build his skills. We had Michael sit at the table with us during meals, playing with real food even as he received his meal pumped through a tube. We bought different types of bottles and sippy cups, one after another, after another. We offered him countless different foods, including every junk food a kid could dream of. We experimented with different consistencies, different textures and different flavors. We tried feeding him, and we let him feed himself. We began reducing Michael’s tube feeds to increase his hunger. Every day, Sarah worked with him to keep moving forward, and Michael made progress. One day, one of Michael’s physicians suggested that we just pull the tube to see what would happen. We did, and then we held course as his team complained through a month of weight loss, continuing to endure the conflict arising from the discrepancy in our approaches. In his second month without a feeding tube, he finally began eating and drinking enough to gain weight. Michael gained slowly at first, but by 16 months of age, he was gaining weight at four times the rate he gained while tube-fed. I will not even try to describe the feeling that came from watching our little toddler, tube-free and having fun eating at the table next to his big brother, and knowing that our family was beating the odds. By this point, I firmly believed that the Improvement Kata approach had value far beyond the high-rate manufacturing context in which it is often assumed to belong. We had discovered value far beyond business processes, but we had just started. My family was about to take a huge leap of faith, by counting on the idea that having a direction and experimenting toward it beats making an action plan based on what is known upfront. As mentioned above, the repairs performed during Michael’s third surgery failed. In fact, they failed pretty badly. The very week that Michael lost his feeding tube, he had entered a developmental growth spurt that quickly had him talking, running, playing and starting to cause lots of toddler trouble. Yet soon thereafter, we noticed some concerning symptoms, including a sharp decrease in his energy level. He began having bouts of labored breathing, frequently taking incredibly long naps, causing much less trouble and going through days-long phases where he just was not his usual sweet silly self. His cardiologist had told us immediately after the third surgery that the valve leakage was not much better than before the surgery, but we pressed for him to continue exploring. Finally, it was discovered that the repaired artery had become so large that it was compressing the nearby artery that carries blood to Michael’s left lung. And further, the valve leakage had grown worse than ever. We had been hoping that Michael wouldn’t need any further surgeries until the final palliative procedure at about three or four years old, yet now at 19 months old it looked like he badly needed another unplanned surgery. Michael’s (new) surgeon provided a treatment plan that was straightforward, low-risk and low difficulty, but we were concerned that it carried significant risk down the road. We sought opinions from various experts, including some of the top experts in the country, and confirmed our fears. As we learned more, we came to the conclusion that a particular treatment approach proposed by Boston Children’s Hospital would give Michael his best chance at a long life, and that we needed to get him out there for yet another surgery to repair these stubborn complications. The good news was that the chief of Cardiac Surgery at Boston Children’s Hospital, the top surgeon at perhaps the top pediatric cardiac surgery center in the country, had agreed to perform this challenging surgery and had even made room for Michael on his crowded surgical calendar. The bad news was that our HMO was flatly refusing to cover the procedure at to Boston Children’s, and was not even engaging in discussion of our technical concerns. They pointed out that our existing surgeon had generally outstanding results and a stellar reputation, and left it at that. So there we sat last August, our struggling one-year-old son scheduled for surgery on the other side of the country less than one month hence, and with absolutely no idea of how we were going to make that happen. The temptation was to make some sort of plan, but at that point, the only plan we could see would involve immediately and permanently relocating to Massachusetts in order to qualify for coverage through that state’s health care exchange. To say the least, picking up and leaving everything that Sarah and I had ever known for somewhere to which we had never been and had no prospects was not an appealing proposition. I decided to count on the Improvement Kata to get us through. We explicitly set our target condition: to get Michael in the door at Boston Children’s for surgery as-scheduled, and to be together as a family for whatever happened. And I firmly decided: I will not make a plan. Instead, I began experimenting at a furious pace. I began fighting with my HMO to authorize the procedure in Boston, exploring various options ranging from appealing to its chairman to menacing it with lawyers. I explored the possibility of changing health plans, even if it meant filing for separation or divorce from Sarah. I explored the possibility of arranging for out-of-pocket payment of the surgery —which we could not afford — and assuming the mountain of debt that would entail. I explored the legal meaning of “permanent residency” in Massachusetts, and the possible ramifications of impermanency. I maintained a running list of the points I felt were important to explore along my threshold of ignorance, and every day worked to push that threshold back and see what I found. Time passed as I made countless phone calls, scoured the Internet, wrote letters, sent emails and asked a lot of people a lot of weird questions. I learned a lot but found no clear path, and Boston Children’s grew increasingly impatient with my lack of a plan to get them paid. Just two days before our scheduled flight to Boston, Sarah and I still did not know how we would get Michael into the hospital or whether we would be coming home. We were awaiting the State of California’s decision on our appeal to overturn our HMO’s denial, and most of our hopes for coming home lay in that basket. Our fallback plan was to get Michael into surgery with coverage through MassHealth, Massachusetts’ state-funded health plan, in which case we would not be coming home to California. And still, I was exploring. One day before our flight, as I was soliciting an expert’s feedback on whether a particular harebrained gimmick would allow us to continue straddling these two paths, a completely unforeseen path appeared. Without getting into details, this option would cover Michael’s surgery, give us flexibility to return to California and still allow us to abide by the law. Suddenly, we could see the path to Boston, and by then it was short. In the air the next day, somewhere over Nevada, I shelled out eight bucks to log onto the airplane’s Wi-Fi and finally started executing. A few days later, the final pieces came together as my family relaxed in a modest hotel suite 30 miles north of Boston: insurance had approved Michael’s surgery and everything was set for his pre-op appointment in a couple of days. To put it lightly, that was a good day. As it would turn out, that was the high point for a while. Michael was 21 months old and in poor shape by the time we got him into surgery, and although the cardiac repairs were successful the surgery brought multiple new complications and a month-long in-patient stay at Boston Children’s. For about two weeks of his stay, Michael was teetering at the edge of a precipice as we worked to help him recover. At close to three weeks post-op, Michael amazed his medical team by suddenly turning the corner and earning a ticket out of the cardiac ICU. Two weeks later, Maxwell and Michael were throwing sand at each other at a beach on Cape Cod. “Remarkable” was the least dramatic word used by hospital staff regarding his recovery. Indeed, almost two months after we arrived, we flew out of Massachusetts with a new child. Since coming home, Michael has more energy than ever. For the first time ever, he’s just a little boy (who happens to be small, skinny and currently on oxygen). Now a two-year-old, he spends long hours imitating his big brother and terrorizing his parents, defiantly declining our requests, ignoring our counsel and earning himself several time-outs each day. Rather than needing the occasional four-hour nap, some days he fights off his nap altogether. He’s a complete pain in the neck, but realizing what could have been turns our annoyance to joy. Well, sometimes it does. In any case, today is good, and even though tomorrow is extremely uncertain, we’ve come to believe that we’re equipped to face it. That comfort with uncertainty is a benefit that Toyota Kata promises. It is a self-reinforcing mindset, growing more powerful with each successful application. Encouraged by our past victories, we’re now continuing to rely on this approach of scientifically exploring — rather than presumptively planning — our path forward as even larger challenges are now emerging ahead of us. Yet I believe that our successful applications are only part of the picture. There is another critical part of this picture: the unexpected benefits. I never anticipated the fulfilment that I have felt watching the love grow between Max and Michael. I never expected to appreciate the beauty of two screaming, crying toddlers, or to find peace after an argument with Sarah, understanding that I am much better off with these problems than without. I did not predict that my family would get to see New England in full fall colors, or that Max and I would enjoy a game at Fenway Park, and that these experiences would be made so much more meaningful by the context in which they occurred. Sarah and I have been dissatisfied with our region and wanted to move away together for years, but we always lacked a destination — now we know where we want to raise our kids. Personally, I have always been somewhat adrift in my professional life; advancing by taking whatever falls in my lap, then getting bored but toiling away until something else showed up. I never considered that through our struggle to raise Michael, a burning purpose might be ignited to reshape my career. Now I have got some crazy ideas and a passion to go reshape health care. Also, I have always been something of a complainer and cynic, quick to observe problems and let them become an excuse for inaction or a basis for mocking somebody. Now I believe this type of negativity to be our greatest hindrance, and that the problems we observe are nothing more than doors that open to something we cannot see today. It is often said that people don’t really change, but I have begun to change, really change, to the benefit of myself and my family. My employer, and my manager, gave me an incredible gift by teaching me the Improvement Kata. They could have had no idea where this would lead, but maybe that is the point. Uncertainty isn’t just not bad, it’s amazingly good. It turns out there’s incredible beauty and constructive potential in uncertainty if we allow what it hides to unfold, instead of paving it over with the artificial certainty of the action plans we have learned to live by. What a wonderful gift for an organization to give to its employees. What an unpredictably powerful force to turn loose in helping an organization pursue its purpose. What an interesting way to bring joy to the workplace while creating capability for an organization to survive in a tumultuous environment. I often hear people classify Toyota Kata as a process improvement tool. This happened most recently when my family was in Boston, and I just shook my head at the ignorance of the speaker. That is the old cynic and complainer in me, still alive and well. Next time I hear someone voice this misconception, maybe I’ll go talk to them, to open that door and see what sort of treasure lies on the other side. This story was told from my viewpoint as a husband, parent and customer of the health care system. We could turn it around and ask what does this suggest for the health care system? It is clear to us that if we simply fit ourselves into the system and followed our advice, the results would have been much less positive — possibly our son would not be living as long as he has. Yet many people do just that — put themselves in the hands of the system and execute the orders that they're given. I believe there is a deep parallel between how lean has traditionally been approached (i.e., expert-driven and event-based) and how health care is delivered (i.e., doctor-driven and appointment-based). The improvement kata-coach kata evolution in lean suggests an analogous direction for health care transformation at a fundamental level. I believe the future of successful health care lies in beginning to transfer the responsibility for improving an individual's health outcomes from the professionals to the individual (or their loved ones), with the professionals providing coaching, technical expertise and goods and services pulled by individuals to support their improvement effort. This means going beyond current initiatives that attempt to increase the patient's involvement in their own care, increase their compliance with the instructions that they're given or even to adapt providers' mindset to focus on the desires of the patient. I have seen first-hand the extremely positive impact that efforts such as the Person- and Family-Centered Care movement have achieved, and believe that these supported the success that Sarah and I have enjoyed in managing Michael's care. Yet these movements appear to have left unaddressed the fundamental conflict that continually undermined our relationships with Michael's care team: who holds responsibility for problem-solving. Toyota Kata is revolutionary in part because it calls on front-line managers, who have typically earned promotions by being excellent problem-solvers, to share the responsibility for process improvement with the employees who report to them. Yet these managers are still asked to retain responsibility for the outcomes of those employees' improvement efforts. Thus coaching those employees to develop within them a scientific mindset where processes improve toward an outcome, becomes the task for managers. That is, these managers are asked to shift their problem-solving skill from improving their processes to developing their people through repeated improvement efforts. Sarah and I attempted to take the responsibility for problem-solving to improve Michael's health away from his medical team, and looked to the team to provide coaching and technical expertise to ensure that our thinking was sound and our steps wouldn't hurt Michael. In doing so, we inadvertently created conflict with these good people who have been trained and made liable for directly problem-solving the individual's health. Despite our success with Michael, our results might have been much better if we had been able to work more cohesively with his medical team. Our approach continues to generate tension to this day, creating the need for us to begin looking at how to reconcile these perspectives. Whatever the countermeasures we test, they will not include handing problem-solving responsibility back to the team. For we have seen, time and again with painful clarity, that to the degree that improving an individual's health relies upon a doctor for problem-solving, the same failure modes exist that hinder improvement within organizations. We have seen that physicians simply lack proximity to Michael to be able to directly observe his day-to-day patterns the way we can. We have seen that we cannot communicate our observations to physicians without significant loss of detail and context, and that at any rate these scientists tend to distrust observations not made with their own senses or appearing in a colleague's report. We have seen that, relying on appointments scattered days, weeks, or months apart, physicians cannot possibly make assessments and adjustments at a high enough frequency to fend-off the degrading pull of entropy. They are driven to make inherent assumptions and choose from pre-existing solutions that inevitably reduce the reliability of their improvement effort. Indeed, even ignoring problems in our insurance model, I suggest that the basic model of physician-as-problem-solver for an individual's care is proving too costly and unreliable for modern society's expectations. No one can know the path to a new model of person-as-problem-solver and provider-as-expert, but I believe that a bright future for health care lies in that vision — an extension of the tremendous Person- and Family-Centered Care movement. Fortunately, with the advent of technologies including Toyota Kata, our understanding of how to improve toward a challenging goal is opening the door to this new model where people can begin to take responsibility for achieving the life quality they desire. Craig Koele is the CEO of two specialty hospitals in the Tulsa, Oklahoma, region, and began practicing the Kata approach in 2014 to tackle a wide range of business challenges. Hundreds of coaching cycles have been held beginning by training an Advance Group of key executives who became coaches for learners in many departments. In the first hospital tackled, 20 learners were taught with 400 total coaching cycles in about three months. The early activities were specifically focused on what were thought to be simple problems such as getting nurses to comply with scanning of barcodes on armbands to verify it is the right patient and right medication. This “simple example” required about 15 coach cycles over two months. Early assumptions about the problem (e.g., nurses are poorly trained) and solutions (e.g., hold training sessions) turned out to be totally unsuccessful, and it was the eighth try of experimenting at the gemba (purchase the correct, waterproof armbands so the barcodes did not wash out when patients took showers) that significantly improved the usage. This focused and iterative approach to improvement is not the norm in health care, where heroic “firefighting” by leaders is much more common. Even improvement specialists, well trained on lean principles, tend to favor the hero approach in health care. 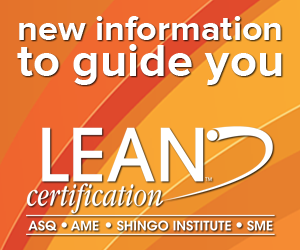 Michael Lombard, in his role as corporate director of operational excellence at Cornerstone Healthcare Group, is Koele’s lean coach. Through repetitive practice of the Coaching Kata, Michael has learned that his own approach to facilitating improvement needed to evolve. “When I first began working in hospitals, I thought that because I was a Six Sigma Black Belt or whatever, and many of the hospital leaders were clinicians with little to no formal process improvement training, I needed to be the hero and lead the improvement effort,” he said. “This specialist-led approach can be effective at producing short-term results, but doesn’t necessarily change the habits and mindsets of the people running our hospitals. Note from Professor Jeffrey Liker: Two of the many areas where practice of the Improvement Kata and Coaching Kata seems to be growing these days is in personal life and in health care. When Tyson Ortiz gave me his article draft to read, I noticed it intersects both of those areas, and it became my pleasure to support his effort to tell his family's kata story. For more information on this topic, please visit Mike Rother's website and YouTube channel. To contact Tyson Ortiz for feedback on healthcare improvement ideas, email: tysonortiz (at) gmail.com.